There is hope after all for Scion if this is true, but you'd better pray hard that this news of a rear-wheel-drive, under $30,000 shooting brake based on the FR-S is legitimate and not just a sick, twisted rumor just to get our hopes up. Car Sales, an Australian publication, spoke to a source at Toyota who has apparently confirmed the possibility of an FR-S sedan of some sort. It could be a traditional four-door. 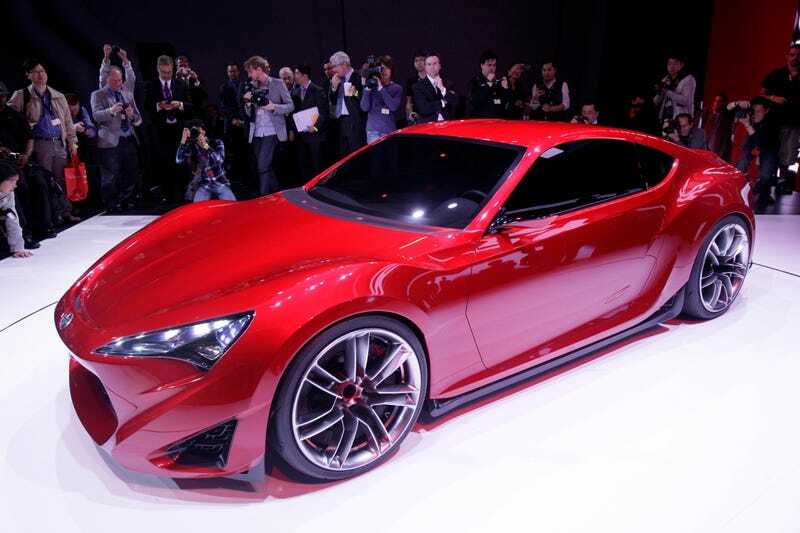 But Toyota is said to be seriously considering a shooting brake version. The FR-S is the best-selling sports car in Australia — who knew? But here in the States, not so much. The entire Scion brand, FR-S included, has been clocking in less-than-stellar sales numbers month over month. My guess is that everyone who wanted an FR-S has bought one. And that no one wants what the rest of Scion has to offer. The FR-S sedan would be slightly longer than the coupe but use the same 2.0 Boxer engine Toyota shares with Subaru in the BRZ. A hybrid version similar to the Yaris-R is also under consideration. And it'd sticker under $30,000 just like the coupe, and be in showrooms by 2015. This sounds like nothing but win. But here's the thing: This news is coming out of Australia. Will this ultimate-Jalop machine make it to the States or elsewhere? Last year, Jason had dinner with some Scion product-development staff and they sounded very open to the idea of an FR-S shooting brake. Orrrrr maybe they stole Jason's idea and took it back to Toyota. Either way, maybe you've got Jason to thank if this thing comes to fruition? And if this thing's a success, maybe more car companies should start listening to Jalopnik.